The lobby is jewelled with hand-made stone designs and surrounded by elegantly decorated lounges. The hotel boasts the most luxurious suites in the country, with breathtaking view of the Acropolis, individually designed to the finest detail with silks, taffetas and decorations from Ralph Lauren, Fornacetti and Versace. Guestrooms are fully air-conditioned and soundproofed, and are equipped with mini bar; direct-dial telephone with voice mail; high speed Internet; color satellite TV with pay channels, video on demand, and video games; marble bathrooms with telephone extension, hairdryer, luxury bath amenities, and bathrobes and slippers. The 159 guest rooms are divided among Classic, Superior and Deluxe. In addition, there are 23 luxurious Junior, Executive and Deluxe suites, plus the two-storey Presidential Suite with living room, dining room and two bedrooms. Room views vary and include the Parliament and the Acropolis. You can indulge yourself at the gourmet Parliament Restaurant, serving both International and Greek cuisine, enjoy the hotel’s Plaza lounges for coffees and desserts, and the Explorer’s Lounge for cocktails. In addition to its gourmet restaurant and lounges, the hotel offers 24-Hour Room Service, laundry and dry cleaning service, a Business Center, state-of-the-art Meeting & Conference facilities, and full banqueting services for any event. 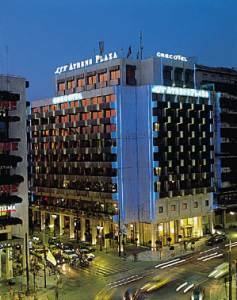 The hotel majestically stands on the corner of Constitution Square, opposite the Parliament, in the heart of the business and shopping district, and within walking distance of the Acropolis and the Plaka.